Local nature lovers can enjoy the rare opportunity to hike, bike, or ride their horses through pristine stands of old growth Douglas Fir, evergreen and fragrant coastal scrub while enjoying ridge-top vistas of our watershed lands, reservoirs, the Pacific Ocean and San Francisco Bay. Although this trail is not open for walk-in use by the general public, trained volunteer trail leaders head excursions three days a week. Skyline Quarry – access to this trail head is at Skyline Quarry Gate, which is 0.7 miles west of the intersection of Lower Skyline Boulevard and Highway 92. Look for the sign. Drive westbound on California Highway 92 crossing under Interstate 280. The “T” intersection before you cross the reservoir is Lower Skyline Boulevard. Go straight through it. Remain on Highway 92 crossing over the reservoir. After you have passed the reservoir drive approximately .5 mile. Look for a gate on the north side of Highway 92. Enter through the gate. Drive .5 mile to the parking area. Cemetery Gate – access via Skylawn Cemetery. Portola Gate – access via Army Road from the terminus of Sneath Lane. Trail excursions on foot, bicycle, or horseback. Trail is 10 miles long and is the SFPUC-managed segment of the Fifield-Cahill Ridge Trail from Highway 92 to Sweeney Ridge. Fifield-Cahill Ridge connects with the 3.7 miles of the Sweeney Ridge Trail open to the public. Visitors interested in connecting their trek on the Fifield-Cahill Ridge Trail with Sweeney Ridge can contact the Golden Gate National Recreation Area. The trail is a gravel service road, with periods of loose base rock. Grades range from 0% to 21%. The steepest grade stretches 1.3 miles from Skyline Quarry (elevation 400 ft.) to Cemetery Gate (elevation 1,050 ft.) on Cahill Ridge, with a vertical elevation change of 650 ft. Approximately 5-7 hours to complete the entire 10 miles on foot, with shorter events to be scheduled as needed. Special thanks to John Fournet and Betsy Lauppe Rhodes of the San Francisco Public Utilities Commission, for assisting us on this project. 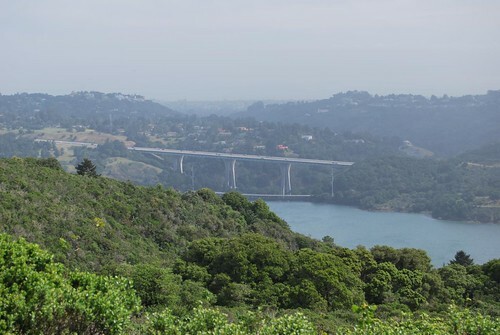 Crystal Springs reservoir, a familiar sight from Interstate 280, has helped serve San Francisco’s water needs since it was dammed in the 1880s. The dam, made of interlocking concrete blocks, survived the 1906 earthquake with little damage. The four reservoirs of the Peninsula Watershed are in the valley created by the San Andreas fault. It flows downhill for miles and miles until it reaches your tap. On its way, it passes towering fir forests, distinctive grasslands, and the habitat of many rare and endangered species. It’s San Francisco’s water, resting on the San Andreas fault, replenished constantly by the cycles of nature, and delivered to you via ingenious Civil War-era engineering. The history and nature surrounding the San Francisco Peninsula Watershed make it much more than a pastiche of hillsides and reservoirs. The watershed, managed by the Public Utilities Commission, is home to trails that offer access to remote wilderness, Northern California geology, and unique opportunities to appreciate the complexity of providing 2.4 million people with a clean water supply. Some trails follow the outlines of reservoirs; others lead to hillside hikes that provide wide-angle views of the watershed. The Sawyer Camp trail, one of the most heavily used in the Bay Area, skirts the edges of Crystal Springs and San Andreas reservoirs, via a six-mile accessible paved path. At the northern edge of PUC land is the Sweeny Ridge trail, managed by the national park service, a 600-foot climb to sweeping views and a favorite with mountain bikers. Visiting the two areas we’ve explored here on the QUEST website lends a dual understanding of the watershed and its simultaneous protection from and integration into the surrounding metro area. The Fifield-Cahill Ridge trail, in a carefully preserved area that includes old growth Douglas firs, demonstrates differing views of conservation measures taken over 15 decades. On the other side of interstate 280, a hike starting from the Pulgas Water Temple gives visitors a chance to ponder the enormity of the task of bringing water halfway across the state, downhill through the mountains, to a growing Bay Area population. A stand of Monterey pines along the Fifiled-Cahill Ridge trail serve as a reminder of past conservation ethics, when ecologists deemed tree-planting as a most vital activity. 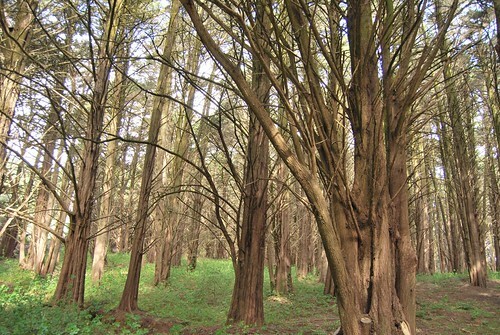 Though they are from the nearby Monterey Bay region, these trees aren’t native to these more northern hills. They were likely planted in the 1930s, possibly to promote fog drip in the hopes that it would contribute to the reservoirs. Running a 10-mile length through the area’s many habitats, the Fifield-Cahill trail may be the watershed’s most special excursion. It was closed to the public until 2003, and even now only parties of 20 or less are allowed, and must be accompanied by a trail guide. Why? It’s all in the interest of preserving the habitat and resources here, and protecting the reservoirs from fire, erosion, and pollution. You can make reservations to explore the trail on foot, bicycle or horse by visiting trail.sfwater.org. Along the trail, hikers get views of all four of the watershed’s reservoirs, as well as a vista of the city, old-growth forests, and a chance to glimpse some rare and endangered species. These reservoirs were the impetus for establishing a protected wilderness here 150 years ago, and they’ve been vital to the development of San Francisco. Their dams were all built between 1860 and 1880, and survived the 1906 earthquake, despite their locations along the San Andreas fault line. The landscape here is perfect for catching rainfall. Coastal marine layers move on shore over the hillsides, dumping lots of rain into the rift valley. The area around Pilarcitos reservoir can sometimes receive four or five times the rainfall of the airport, which is only 5 miles away. On their own, the four reservoirs—Upper and Lower Crystal Springs, Pilarcitos, and San Andreas—provides about ten percent of San Francisco’s water supply. 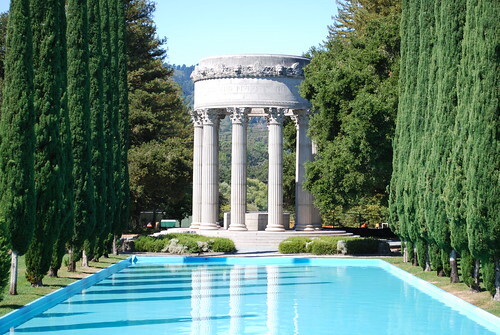 The Pulgas Water Temple was built at the terminus of the Hetch Hetchy aqueduct as a monument to the new water system. It’s located within the watershed, just south of Crystal Springs reservoir. An inscription at the top reads, “I give waters in the wilderness and rivers in the desert, to give drink to my people,” a biblical quote from Isaiah. So where does the rest of the city’s vital H2O come from? The Pulgas Water Temple tells this part of the story, and a climb from the Temple to a nearby ridgetop affords broad brush views of the watershed, putting the whole water narrative together. San Francisco long ago outgrew its four reservoirs. In 1909, with memories of the ’06 earthquake’s unquenchable fires still vivid, the city of San Francisco purchased land in the Hetch Hetchy Valley in Yosemite National Park with the intention to dam the Tuolomie river. The next year, the city voted to build the dam and a 160-mile-long system to carry the water from the mountains to the San Andreas valley, and in 1913 Congress allowed the construction. The effort expended was enormous: $45 million dollars, twenty years of construction, a few deaths and a great deal of politics. In 1934, the first rush of Hetch Hetchy water flowed through the gravity-driven tunnel system, across the California’s central valley. It swooshed through the base of the Pulgas Water Temple and into nearby Crystal Springs reservoir while San Franciscans cheered, and some conservationists frowned. 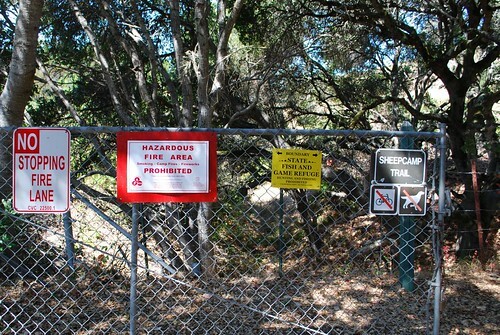 Signs at the start of the Sheep Camp trail let visitors know that this is protected land. The ascension up Sheep Camp trail connects the Hetchy water to its final destination. Climbing to the ridge top east of 280, hikers pass through coastal oak scrub, until reaching the viewpoint. Here, you can see across the valley, taking in Crystal Springs reservoir and the pine and fir stands that the Fifield-Cahill trail passes through, Trekkers with a fondness for geology will appreciate this scene: the reservoir in view sits atop the San Andreas fault, meaning that a hiker here is standing on one tectonic plate and looking out at another, the distant hills moving southward, ever so slowly. Being able to see two tectonic plates isn’t entirely uncommon in the Bay Area. But this vista brings together so much more: an illustration of how humans have made use of the valley created by these plate movements, and harnessed the landscape’s natural slope and the resources in the mountains hundreds of miles east, all with the purpose of providing water—California’s original gold—to the people who flock here for the very magic this set of hikes offers. Join the Fifield-Cahill Ridge Trail photo group on Flickr to share your photos of this amazing place.